Robotic exoskeletons: Ekso Bionics builds a real-life iron man. Could a robotic exoskeleton turn you into a real-life Iron Man? 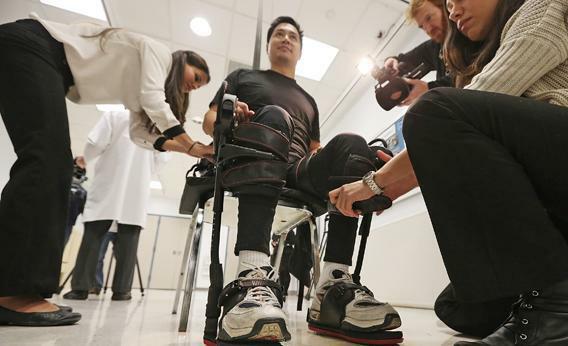 Robert Woo is outfitted with an exoskeleton device to walk in made by Ekso Bionics. Six years ago, a 39-year-old architect named Robert Woo was working on the Goldman Sachs Tower in Lower Manhattan when a crane’s nylon sling snapped, dropping seven tons of metal studs onto his construction trailer. He survived, but he was paralyzed from the waist down. He never expected to walk again. He can’t. But don’t rule out the possibility. Powered exoskeletons once looked like a technological dead end, like flying cars and hoverboards. It wasn’t that you couldn’t make one. It was that you couldn’t make it practical. Early attempts were absurdly bulky, inflexible, and needed too much electricity. Those limitations haven’t gone away. But in the past 10 years, the state of the art has been advancing so fast that even Google can’t keep up. Ask the search engine, “How do exoskeletons work?” and the top result is an article from 2011 headlined, “How Exoskeletons Will Work.” As Woo can testify, the future tense is no longer necessary. The question now is, how widespread will they become—and what extraordinary powers will they give us? Woo’s exoskeleton, a 50-pound aluminum-and-titanium suit that takes a step with the push of a button, is called the Ekso, and it’s the flagship model of the Richmond, Calif.-based startup Ekso Bionics. The company has already sold three dozen to hospitals and clinics in 10 countries and plans to start selling them to individuals next year. Last May, a paraplegic woman named Claire Lomas used a similar device created by Israel-based Argo Technologies to walk the London Marathon. Next year, Fortune 500 firm Parker Hannifin plans to release its own version, said to be the lightest yet. One physical therapist calls it the iPhone of exoskeletons. Other companies, including defense giant Lockheed Martin, are already eyeing the next step: commercial exoskeletons and bodysuits aimed at enhancing the strength and endurance of nondisabled people. Using technology licensed from Ekso, Lockheed is working on a device called the HULC—the Human Universal Load Carrier—that would allow soldiers to tote 200 pounds for hours without tiring. Unlike the Ekso, the HULC won’t take your steps for you. Instead, it uses accelerometers and pressure sensors to read your intentions, then provides a mechanical assist, like a power steering system for your legs. In Italy, researchers have built a “body extender” robot aimed at allowing rescue workers to lift a wall from an earthquake survivor. Engineering students at Utah State concocted a vacuum-powered “Spider-Man suit” with which a soldier could scale the sheer side of a building. Ekso’s ExoHiker and ExoClimber target the outdoor recreation market. In Japan, a firm called Cyberdyne has developed what it calls Hybrid Assistive Limb technology to help home caregivers hoist an elderly patient from the bathtub with ease. Cyberdyne says its name wasn’t intended as an allusion to the fictional firm that created the evil computer network in the Terminator films. Still, sci-fi reference points are inevitable for a technology that until recently existed only in movies and comic books. Iron Man is just one obvious touchstone. From Starship Troopers to Aliens to Avatar, powered armor has long been a staple of imaginary intergalactic conflicts. But the comparisons between Hollywood’s exoskeletons and their real-world counterparts are as inapt as they are inescapable. To companies like Ekso, the fictional technologies serve as both an inspiration and a frustratingly unrealistic benchmark. “In the early days, the DARPA days, it really was science fiction,” says Russ Angold, who co-founded Ekso in 2005 to develop technology pioneered only a few years earlier by UC-Berkeley engineers working under a Department of Defense grant. The company was originally called Berkeley ExoWorks, but the concept of an exoskeleton was so foreign to the general public that they decided to change it to Berkeley Bionics, a reference to the TV show The Six Million Dollar Man. The solution: mimicking the structure and movement of the human body, which conserves energy remarkably well, especially when at rest. Minimalism is also key—the HULC forgoes luxuries like arms or headgear, which makes it not much of a Hulk by Hollywood standards. But it still has funding. Ekso and its kin appear likely to succeed as medical devices. The barriers are convenience and cost—the Ekso will start at a hefty $110,000—but those seem surmountable. Argo’s version is under $70,000, and Parker Hannifin is aiming for a similar price point and a weight of just 27 pounds. All of those figures should come down over time. And the inconvenience is a small price to pay for people like Woo to be able to stand up and walk across a room again. Exoskeletons’ future in war and the workplace is less secure. Lockheed has yet to find a killer military app for the HULC, whose strength enhancements come at the cost of agility. The most plausible use for the time being is to help people carry or unload heavy equipment at a forward operating base where you can’t drive a truck or a forklift. Likewise, anyone expecting Utah State’s Spider-Man suit to give them powers akin to those of the comic book superhero are in for some sore disappointment. It’s useful for one thing: climbing a wall, which it does loudly and slowly, making it less than ideal for a covert operation. The same goes for suits that let you race a fighter jet, beat up a grizzly bear, or even sense danger from behind. You wouldn’t want to walk around in any of them. Read more from this series: Human enhancement is giving us superpowers once reserved for comic-book heroes; technology is expanding our minds; brain-computer interfaces let you move things with a thought; and choose your own sixth sense.